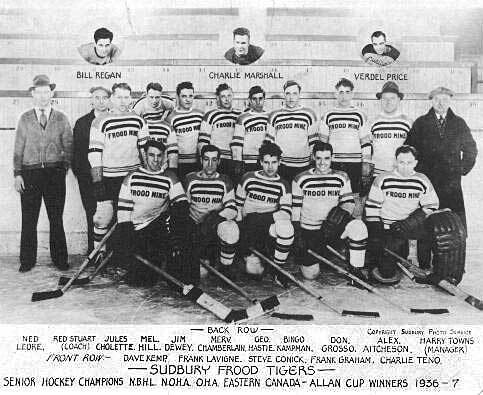 Mel Hill played hockey with the Sudbury Frood Tigers in 1936-37, winning the Allan Cup in 1937. 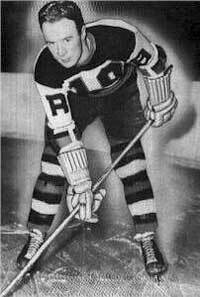 In 1937 Mel joined the Boston Bruins of the NHL and was to become a very famous player. In the 1939 Stanley Cup Playoffs between the Boston Bruins and the New York Rangers, Mel would accomplish the unthinkable. Game one with the Blue Shirts went into overtime and Art Ross told his players to feed little known Mel Hill. Sure enough, late in the third sudden death period, Hill took a pass from Bill Cowley and beat Davey Kerr. That was one! The second game was also tied after regulation and once again the Cowley and Hill combination scored. That was two! In game seven in the third overtime period, Cowley hit Hill with one of his skillful passes and guess what. That was three! After scoring three overtime goals against the New York Rangers and eliminating them, Mel Hill and the Bruins went on to defeat the Toronto Maple Leafs in five games and claim their second Stanley Cup. From that point on, Mel Hill was known around the league as Mel "Sudden Death" Hill.